Replace your old carpet with the perfect type of new carpeting from our flooring store. We boast a collection of carpet flooring in an array of patterns, colors, and fibers. You can also count on us for carpet installation services, which we can include in your initial purchase. You will not find a friendlier or more knowledgeable team of sales associates at other carpet stores. Find the perfect carpeting for any room in your home with one visit to our fully stocked carpet store. Here you will find great deals on a wide range of carpeting options. Get luxurious plush carpet to make any room more comfortable, or opt for more resilient and economical Berber carpet that resists stains and lasts a long time. Regardless of the carpet material you choose, rest assured you will find the floors that best suit your needs in looks, performance, and price. If you are not sure what type of carpet you want, ask one of our flooring consultants for assistance. We can explain the different traits each type of carpeting has, and help you locate the style of carpet you desire. We want to ensure you feel completely confident in your new flooring purchase. Our team has experience matching flooring with interior room designs. If you set up an in-home consultation, we can give our professional opinion on the type of carpeting that would best suit the interior style of your home. Let us help you find the ideal match, whether you are upgrading your existing home décor, or choosing floors for a new building. The key to selecting the right carpeting lies in the ability to personalize your options. At our carpet store, we offer complete customization of any carpet installation. From the material and cut of the carpet fibers to the color, brand, and style, you can mix and match these different options to create your own unique carpeting. This is a fun and affordable way to personalize any room in your home, giving it a one-of-a-kind look. Our store offers several carpet styles, including Berber, Frieze, and Saxony. Frieze carpet hides the imprints made by foot traffic, but the carpet fibers are higher up, making it softer to the touch. 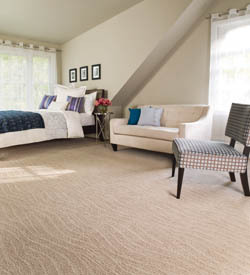 Saxony carpet is extremely smooth and soft with a luxurious plush look that makes it a great choice for master bedrooms. Berber carpet is a popular flooring choice for a number of reasons. It has bulky yarns with individual loops that are easily visible, offering an impressive blend of comfort and aesthetic appeal. There are unique designs and color options available in Berber carpet, making it a versatile flooring material. With flecked-color schemes and a range of color options, this carpet style will fit in seamlessly with any interior design scheme. Living rooms and family rooms are areas where Berber carpet is commonly found. That is because it is known for its especially durable fibers. They can endure frequent foot traffic without showing signs of wear and tear. The material is also stain resistant. Homeowners with pets and children appreciate how much easier it is to clean up spilled drinks and foods without worrying about leaving behind a permanent stain. With so many advantageous attributes, it may surprise you to learn that Berber carpet is also one of the more affordable flooring options we carry. Considering how long you can expect your new carpeting to last, and how competitive our prices are, it is easy to see why it offers unbeatable value. Of course, the price varies depending on the carpet material and the style you choose. Tell us what kind of carpeting you desire and we will provide you with a free estimate. If you want your carpeting to look as good as you originally envisioned, let our highly trained installers perform the carpet installation. We have experience with carpeting projects of every size, and we know how to do the job efficiently and correctly. Your new carpets will have a smooth, even surface, so you do not have to worry about bumps in the middle or curling along the edges. Our professional carpet installers will treat your home with the utmost respect. If there is any furniture that needs to be moved, we will do so carefully. Once the job is complete, we make sure to clean up any leftover materials and leave your home exactly as we found it, with the addition of stunning new carpet flooring. Contact us today to request a free estimate on any type carpeting we have in stock. We proudly serve Minnesota City, Winona, Goodview, Buffalo City, Dodge, and the surrounding areas in Minnesota, as well as Arcadia and Galesville, Wisconsin.